Bolivia crowned its new queens for 2017! Gleisy Noguer Hassen won Miss Universe Bolivia 2017 title on July 1 and will represent Bolivia at Miss Universe 2017 pageant. She succeeds last year's winner Antonella Moscatelli. 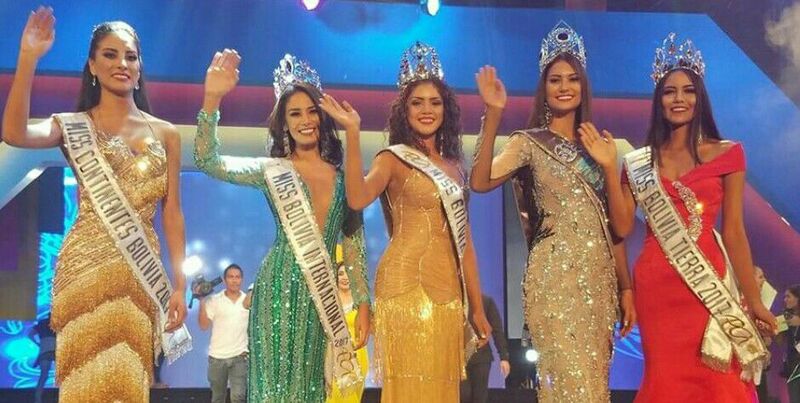 After Yasmin Pinto was crowned Miss Bolivia World, the judges had to choose Miss Bolivia Universe. After a triple tie, it was Miss Pando, Gleisy Noguer, won by 1 vote difference and is now Miss Bolivia Universe 2017. Carla Maldonado Simoni was crowned as Miss Bolivia International 2017 and will represent Bolivia at Miss International 2017 in Japan. Giancarla Fernández Ferrufino was crowned as Miss Earth Bolivia 2017 and will represent the country at Miss Earth 2017 in the Philippines. Nimeyra Flores Hurtado got the Miss Continentes Unidos Bolivia 2017 title and will represent Bolivia at Miss United Continents 2017.